We are excited to invite everyone to come join us on Christmas Eve for a special country Christmas! This season holds incredible meaning. You see, God sent His Son to come into this dark world. God was invading with His light. The very first people to find out about this history-altering truth were a lot like cowboys--shepherds. They were just simple people who were acquainted with hard work, open country, the harsh elements, and with animals. This good news of Christmas is for cowboys. Even more than that, God's son found His first home in a manger! God loved us so much that He was willing to stop into our poverty and darkness in order that we could taste the goodness of Heaven. The love of God came knocking on our door. We're going to have an incredible party as we celebrate the birth of our Savior and to worship Him. You won't want to miss this amazing time as we listen to great cowboy music, hear a powerful message, and enjoy the friendly faces. 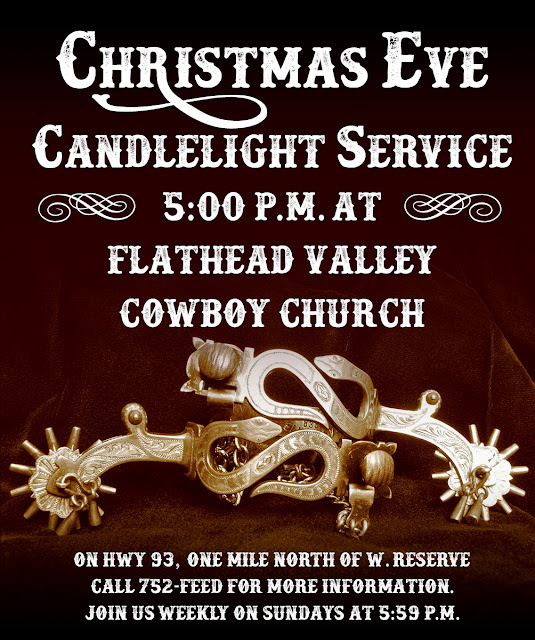 We're going to have candles and just about every other thing a cowboy could need to celebrate Jesus' birth. (By the way, you don't have to be a cowboy to come. Everyone is welcome. Just come as you are and enjoy a great evening!) See you there! 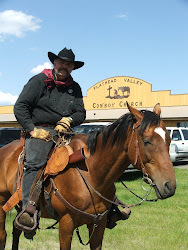 Welcome to Flathead Valley Cowboy Church where the coffee is always on and there’s always something to smile about. We can’t tell you how pleased we are that you’ve stopped by to check out our outfit. So pull up a bale, put your feet up and let us share some good news with you. We’re excited about what God’s truth, love and power are doing to give people a new start in life! So if you love the western lifestyle and you’re looking for a life-changing relationship with your Creator, you’re welcome to come hang out with us for the ride of your life. Sunday evening at 5:59 P.M.
1.4 Miles north of W. Reserve Dr.
All content © 2014 Flathead Valley Cowboy Church unless otherwise noted. Powered by Blogger.